Starfish aren't actually fish, and they don't swim in the traditional sense, but they are able to glide along the bottom of the sea with their tube feet. Sea stars are famous for their ability to regenerate lost limbs, but the process isn't quick. It takes several months to years to fully regenerate a lost limb. Still, it is quite an amazing feat! Price given here is for a single two inch by two inch tile; the group photo is shown to give an idea of how multiple tiles look together. This design is also available in the 3"x3" and 4"x4" sizes. 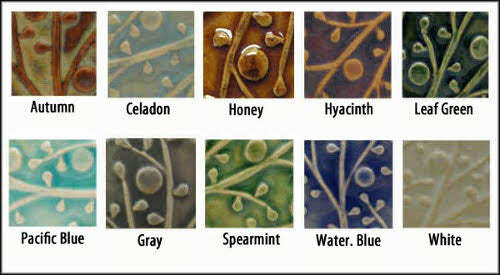 Available in many types of glazes, all non-toxic. Made by hand using traditional techniques. Ideal for temporary or permanent installation. Inspired by the beauty of nature and the mystery of the oceans. Made with natural materials. Glaze is carefully brushed on every tile's top and sides. Long lasting, high fired ceramics. Approx. 1/2" thick at edge, slightly thicker where the raised starfish design appears.